We are learning how climate change is impacting redwood forests by tracking forest conditions over time in the RCCI network of old-growth forest plots distributed throughout the geographic range of coast redwoods and giant sequoias. Scientists recorded baseline conditions for each plot between 2009-2012 and now visit the plots annually to measure tree survivorship and document local weather within the forest. This year, scientists will conduct the first full plot surveys since the plot establishment five years ago to detect changes in redwoods’ wood production, forest carbon storage and biodiversity. Ancient redwood forests store at least three times more carbon above ground than any other forests on Earth. Changing environmental conditions have triggered a growth increase in coast redwoods and giant sequoias. California summers have warmed, but precipitation has remained highly variable and not decreased over recent decades. One discovery by our leading scientists is that ancient redwood forests store at least three times more carbon above ground than any other type of forest. “The trees are sequestering carbon in their wood, which is incredibly resistant to rot,” said Emily Burns, Director of Science. Another finding is that because of environmental changes, some redwoods have grown more since the 1970s than they ever have. One hypothesis for the growth is that rising temperatures are lengthening the growing season. In the coast range, decreasing fog may provide the trees more access to sunlight. Another factor may be more carbon dioxide in the air. You can learn more by watching Stephen Sillett present his findings at the the 2013 Redwood Ecology and Climate Symposium. “These results bolster our mission to protect redwoods because these trees are pulling incomparable amounts of carbon dioxide out of the atmosphere, which helps combat global warming,” Burns said. Review RCCI Research Abstracts to learn more about these initial results. indeed, through their remarkable capacity to capture carbon, they are playing a positive role in the effort to fight climate change. Future research will address how younger forests and associated plants and wildlife are responding to climate change to help direct our restoration and conservation investments to the greatest effect. Your generous support helped to make this research possible and funds are still needed to continue this critical work. 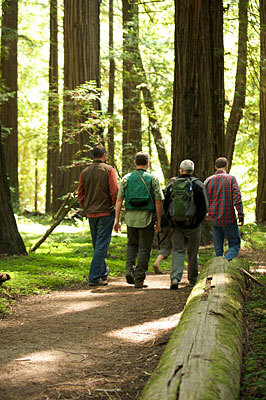 The more we know about the redwoods, the better we can look after them. We look forward to learning and sharing much more through the important work of the RCCI program. Thank you. Monitoring the local weather and long-term climate is an integral part of the Redwoods and Climate Change Initiative (RCCI). Beginning in 2011, scientists from UC Berkeley installed weather stations across the range of coast redwood and giant sequoia forests in six of the 13 RCCI study sites. Monitoring environmental conditions over time at these study sites will enable scientists to understand (1) what weather events are impacting the trees at each site, (2) how climate is changing in these iconic forests, and (3) may help identify sites that are changing most dramatically. At each site, a weather station was installed at the top of a sentinel (emergent) tree and on the forest floor. The purpose of having a treetop and a ground-level station is to be able characterize the conditions that both fully-grown trees are experiencing and the next generation of giants (seedlings and saplings) as well as other plants and animals who inhabit the forest floor are experiencing. The weather data collected so far indicates that in the coast redwood forests, temperatures and precipitation follow a predicable latitudinal gradient, with the forests in the north being on average cooler and receiving more rain than those in the south. The temperatures at the giant sequoia sites are strongly influenced by the elevation of the site, more than the latitude. Giant Forest is at the highest elevation and is on average the coldest site while the most northern site, South Calaveras Grove, is at the lowest elevation and is the warmest. Precipitation in the giant sequoia forests generally follows a latitudinal gradient as seen in the coast redwood region. Although the average, year-round conditions follow those general latitudinal and elevational gradients, the season to season (interannual) dynamics are a bit more complicated. For instance, at Montgomery Woods State Natural Reserve in north-central California, the average summer temperature is much higher than at the most southern site at the Landels-Hill Big Creek Reserve. This is because Montgomery Woods is farther from the coast, nested within an easterly facing steep valley, and is not cooled by summer coastal fog. The RCCI weather station records show that coast redwood and giant sequoia forests had less rainfall and warmer temperatures in 2014 relative to previous years. With less water coming into the forest and warmer days drying the soil, these drought conditions can greatly reduce water resources for the trees and other plants. To find out if the current drought is affecting the forest, the RCCI researchers are visiting all the study sites to check for tree mortality and study redwood growth rates. Since 2011, forest air temperature has warmed. This graph shows the average monthly temperature at the redwood treetop in coast redwood and giant sequoia forests. The top graph is from the giant sequoia forests at Calaveras Big Trees (CBT), Giant Forest (GF) and Freeman Creek (FC). The bottom graph is from coast redwood forests at Jedediah Smith Redwoods State Park (JSU), Montgomery Woods State Natural Reserve (MW) and Landels-Hill Big Creek Reserve (BC). Watch our latest video to learn more about how RCCI scientists monitor weather in the plots. You can also check out a fun video about the challenges of maintaining weather stations in bear country.